As I’ve blogged before, I hosted several teas celebrating Hill County’s Centennial back in 2012. Had it not been for me, the milestone would have gone virtually unnoticed, and I was happy to host events and share the celebration with guests. One of my teas was around Halloween, so I called it the Hill County Centennial Celebration Halloween and History Mystery High Tea. The guests that came were truly wonderful and we all had a great time! I used an off-white linen-look tablecloth for the base (thrift store). Fiesta Persimmon dinner plates were topped by its companion P86 Yellow salad plates, to serve for the entrée and salad course, respectively (various sources and The Bon Marche in Great Falls, now out of business). Appetizers were served on cute black cat plates by Living Quarters (Herberger’s). All rested on black square chargers (Walmart). The bread and butter plates were antique yellow lustre ware (thrift store). Flatware was Little Hoot by Rachel Ray (QVC) and have a little owl on them. Cutting knives were by Chicago Cutlery (Herberger’s) and rested on lead crystal knife rests (Victorian Trading Company). Tea was served in Fiesta Persimmon cups and saucers (various sources), and water was served in crystal goblets made in West Germany (thrift store). 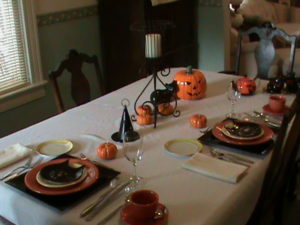 Hauge napkins (K-Mart) and place card settings using mini pumpkins rounded out the covers. The centerpiece consisted of a neat bronze colored metal candle holder (can’t remember the source at this time, but it was one of those homewares party items), Grandma O’s ceramic Jack O’Lantern with a cute black cat figurine that reminds me of Shorty (Herberger’s), a metal witch’s hat candle holder (dollar store), and little mini pumpkins. Tea was served in an orange with black cats tea pot called “Catitudes” (Bigelow Teas mail order catalog), and antique black cat sugar and milk jug set stood at the ready on a silver plated tray (all thrift store finds). It was a great evening filled full of fun, friendship and history! Hill County Centennial Halloween and History Mystery High Tea, 2012.